Just because you are dieting does not mean you can’t enjoy an occasional sweet treat or two. The key is to eat healthy even when you are snacking or treating yourself to dessert. Can a dessert actually provide you with anti-oxidants, vitamins, minerals, amino acids, and enzymes? Is that possible? You bet it is. Healthy raw dessert recipes are the answer to getting raw, uncooked and unprocessed food into our bodies and those of our family. Raw dessert recipes are cost effective and can be made in a reasonable amount of time while providing health-promoting vitamins, enzymes, fiber and healthy fats. They provide us with better nutrition and will help prevent disease and overweight conditions as well as slowing the aging process while increasing energy. You eliminate the culprits that have been linked to degenerative diseases and weight gain including “bad carbs”…all the white flour and white sugar as well as “bad fats”…all the saturated and trans fats and a bunch of unhealthy chemicals and preservatives. The innovative and easy to make recipes included in “50 Raw Desserts” volume one and two allow you to create traditional-tasting cake, cookies, pies and creamy desserts, ice creams and candies that taste good or even better than traditional versions. You’ll replace flour with ground nuts, dried fruits replace sugar, avocados and coconut oil are used in place of butter, cream and eggs. You’ll never miss the wheat, gluten, sugar and unhealthy fats that are present in old fashioned cooking and baking methods. Gone is the bloating, lethargy and guilt when you eat raw desserts. In its place are energy and lightness with the joy of knowing that while your taste buds were treated to something special your body is receiving the gift of quality nutrition. It doesn’t get better than that! Eating raw unprocessed foods is not a new diet…it is a lifestyle change, a shift towards better eating and better health. Replacing traditional snacks, treats and desserts with raw food recipes helps us to achieve ultimate healthy but it also helps us maintain a healthy weight. Not only will you be eating healthier but you’ll be contributing to the future of our planet by getting yourself back into the kitchen and taking control of your own food preparations. Raw foods offer many more options and they are more flexible than traditional baked good so don’t be afraid to adjust and change things up by substituting similar ingredients you need. Here’s an example recipe that is only one of 100 that you’ll receive when you order “50 Raw Desserts” volume one and two. Place almonds, rolled oats, pumpkin and sunflower seeds into a food processor and process until broken down but some chunks still remain for texture. 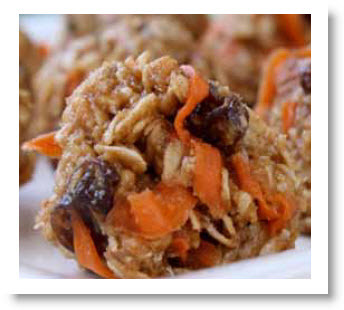 Add raisins, honey, carrots and coconut oil and pulse until well combined. Shape into 2 inch (or large) balls and place in fridge for an hour or two to firm up and set before serving. Simply delicious! And healthy too! Try saying that about traditional dessert!